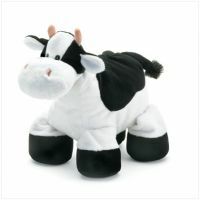 The Floppy Cow Plush is a cute stuffed animal that will capture the attention of children and adults alike. This plush is as comfortable as its name suggests and will be a favorite toy for ages to come. Whether it’s used as a pillow, a decoration, or a cuddly friend, this Floppy Cow Plush is a great gift to give to children, friends, and cow lovers! Ages 3+.